I'm back with another sketch challenge card! This sketch is wide open with lots of room for fun and I had a ton of fun playing with the Color Burst assortments and the new Stars in the Sky - Vertical Die-namics. To create the background I used a number of colors of Color Burst on watercolor card stock. 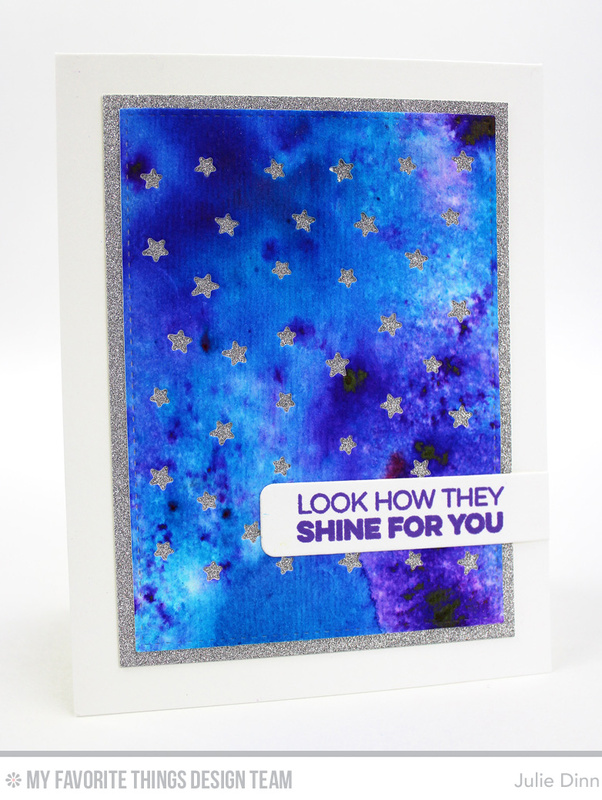 The Stars in the Sky - Vertical Die-namics creates little peek-a-boo stars in the card stock. I placed a piece of Silver Sparkle behind the watercolor card stock to create the starry sky. I wish you could see the sparkle and shine this card has in real life! Be sure to check out the MFT Challenge Blog to see all the gorgeous creations the design team and our fabulous customers created for this sketch. The best starry sky ever! Beautiful background sky. At first I thought it was stenciled on stars. Glad I read the post as well as looked at the images.